This description is from Joel, the Museum’s President and Curator of Gems and Minerals. He’s chosen spectacular objects from the Museum’s mineralogy collection, which includes some of the most rare and fascinating mineral specimens in the world, that we’ll be sharing here – and at 100.hmns.org– throughout the year. 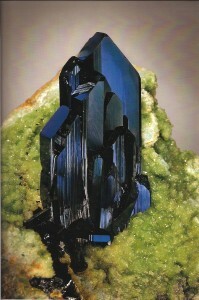 The Tsumeb mine has produced the world’s finest azurite crystals, of which this large 11-cm crystal group on green smithsonite is one of the best examples. The highly lustrous, elongated crystals with perfect terminations, on a contrasting base, admirably fulfill the requirements of connoisseurship. Marvel at the world’s most spectacular collection of natural mineral crystals in the Cullen Hall of Gems and Minerals at the Houston Museum of Natural Science.